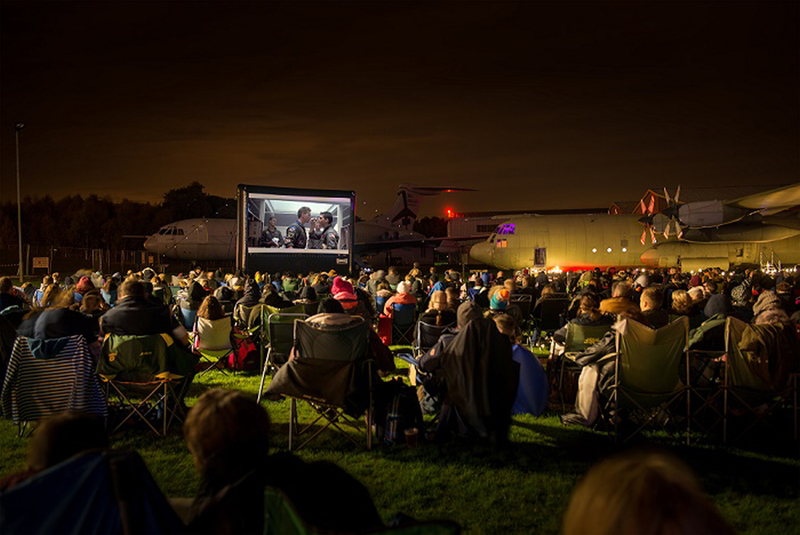 ‘Star Wars’ and ‘Top Gun’ fans are in for a treat this September as the Outdoor Cinema event returns to the Royal Air Force Museum Cosford. The third highest grossing film of all time ‘Star Wars: The Force Awakens’ and one of the most iconic aviation movies ever ‘Top Gun’ will be showcased on a giant inflatable screen at the RAF Museum on 21 and 22 September respectively. Film buffs can enjoy watching light sabre battles and Maverick under the moonlight in what is the perfect setting for films about flight. This evening event will see a huge 30ft inflatable screen erected alongside the VC10 and Hercules aircraft, including digital projectors and sound equipment for a true cinematic experience. No movie would be complete without popcorn and especially for this evening event, the Museum will be transforming an aircraft into a popcorn and snacks bar where visitors will be able to step on-board to purchase their essential movie snacks. The big movie weekend will kick start with the epic space opera ‘Star Wars: The Force Awakens’ on Friday 21 September. Set 30 years after the defeat of the Galactic Empire, the film follows defector Finn (John Boyega) and tough scavenger Rey (Daisy Ridley), whose droid contains a top-secret map concerning the whereabouts of Luke Skywalker, the last of the Jedi Knights. The young duo joins forces with Han Solo (Harrison Ford) to ensure the Resistance, led by General Leia Organa receives the intelligence and team up in their fight against the new threat to the Galaxy from the evil Kylo Ren and the First Order, a successor to the Galactic Empire. This ‘Star Wars’ episode is suitable for movie fans aged 12 and over and visitors are welcome to come dressed as some of their favourite characters from the film. It’s been over 30 years since the 80’s cult classic military movie ‘Top Gun’ first graced the big screen but the magic of characters Maverick and Goose will be flying high during this special evening event on Saturday 22 September. This American romantic military action film stars Tom Cruise as Lieutenant Pete “Maverick” Mitchell, a hotshot fighter pilot who’s reckless attitude puts him at odds with his fellow pilots. The film follows Maverick and his Radar Intercept Officer Nick “Goose” Bradshaw’s journey to refine their elite flying skills, coupled with fighting for the attention of the beautiful flight instructor. Packed with plenty of flying action and romantic comedy, ‘Top Gun’ is a timeless classic suitable for film lovers aged 12 and over. In the build up to the movie, why not take advantage of some of the tasty hot food and beverages on offer. The Ironbridge Catering Company will be joining the event, serving a delicious selection of American inspired street food, all served from their converted yellow American School Bus. Then why not enjoy some cocktails, beer or a glass of fizz courtesy of Jockey Box who will be serving drinks throughout the evening from their converted horse box. A selection of hot beverages will also be available on the night. Film fans are encouraged to bring picnic chairs and blankets for their own comfort as the film will be screened outdoors on a grassed area – there is no allocated seating, so arrive early to get the best spot! Visitors are also welcome to bring their own food and drink on the night, all drinks must be in plastic bottles or cans and no BBQ’s are permitted. Ticket holders will also have exclusive after-hours access to the Museum’s Hangar 1 when gates open at 6pm. There will be plenty of time to enjoy some of the tasty street food, a cocktail or two and of course stock up on your popcorn, before you settle down to watch the movie at 8.00pm (film start time may alter slightly, depending on light conditions). The running time is approximately 2hrs 15mins for ‘Star Wars’ and 1hr 50mins for ‘Top Gun’ and both movies are certified 12A, under 16’s will not be admitted unless accompanied by an adult. If you feel the need for speed, grab your wingman and head to the Museum’s website where tickets are now available to purchase in advance www.rafmuseum.org/cosford priced at £13 per person. Tickets will also be available on the evening priced at £15 per person, subject to availability. Parking for ticket holders is free of charge.